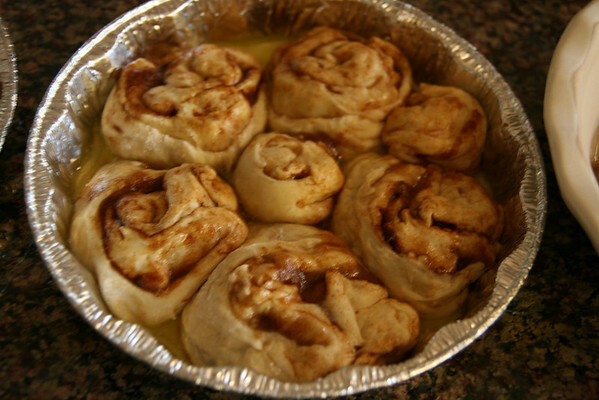 Ever since Santa brought me PW's cookbook for Christmas I had been itchin' to make her scrumdillyicious cinnamon rolls but felt I needed a reason to have that much fun with butter. With my sweet friend's birthday approaching and a little surprise brunch in the works for her, I decided that would be the perfect occasion to bust out my rolling pin. After a quick stop by HEB for foil pans, a brick of butter and a bag of powdered sugar and reading through the recipe at least three times (I was a tad scared), it was time to get cooking. Things were going swimmingly until it was time for the filling. 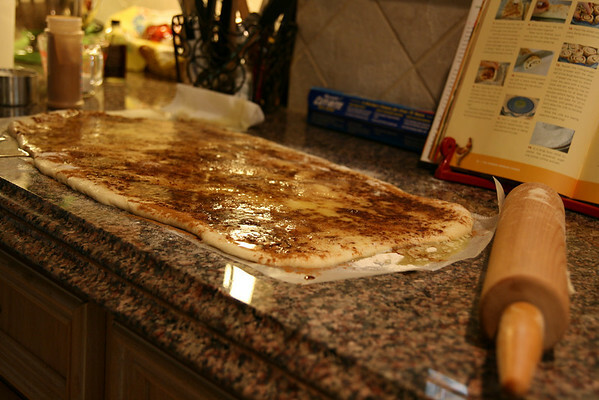 This is where you pour an obscene amount of melted butter on your rolled out dough and then sprinkle sugar and cinnamon until you think you might be arrested for indecency. This is also where the filling takes on a life of its own and proceeds to run in every possible direction. I sensed trouble brewing when I felt a splash of filling land on my big toe. Um, PW? 1 1/2 to 2 cups of butter is A. LOT. I'm just sayin'. I also had a wee bit of trouble rolling up this massive goo pile, slicing it and plopping the goo balls into their buttered pans (yes, more butter) all the while stressing because my version wasn't looking like PW's perfect slices in her pictures. Some pans looked more like actual rolls, some looked like that gooey mass pictured above. In the end, it didn't really matter because the dough rose, took on more of a pleasant roll shape and was eventually covered in delicious icing anyway. WOW! That's pretty much all I can say about that. WOW! These are super yummy! 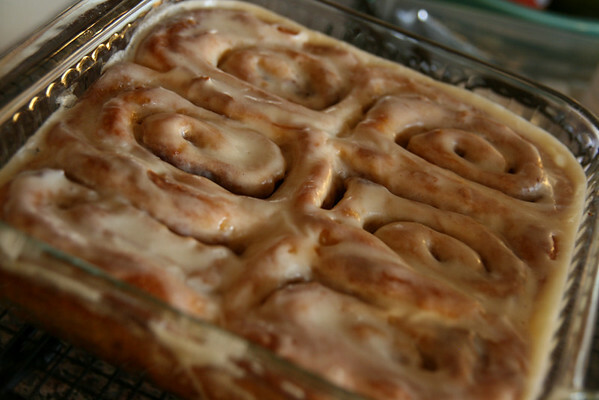 One thing I do to make making cinnamon rolls less messy is to use waxed dental floss to cut them. Sounds crazy but it makes slicing them a snap and doesn't stick to the floss like it does to a knife. Just pull off an approximately 12 inch piece of unflavored waxed dental floss, slide under the roll of dough, cross over the top and pull on each side. It cuts easily and perfectly every time! Mmmmmmmm. I've been wanting to make these too for some time now. Great tip, Shannon, about the floss! Oh yummy...I read your description out loud to my dear husband, T, who used PW's cookbook for the pot roast and creamy rosemary potatoes as a surprise for me last week. We are envious of your ambitiousness! and let me say....they were YUMMY! Thank you so much! Shannon: Thanks for the tip about the floss--I've tried that for cutting cake before but didn't think about it for this--I'll try that for the rolls next time. If y'all are on the fence about making these, jump off and just do it. They are delicious and sharing them (using the foil pans) is fun too. I'll probably make them again for holiday *gifts*--if not before ;). I commend you for your bravery in attempting this recipe! I'm always intimidated by new recipes and would definitely have been by using that much butter and then experiencing such issues with sog. I'm so glad they turned out for you!